In what's hopefully not their final game against the Western Conference this season, the Penguins will play their final regular season game against the West when they take on the Nashville Predators. The Penguins find themselves just a single point behind the New York Rangers for 2nd place in the Metropolitan Division with 6 games left on the schedule, but if they're going to catch New York they'l need to overcome the bad starts they've been having in recent games. It hasn't hurt them too much, as they've gone 9-1-0 over their past 10, but it's a bad habit to get into and could hurt them come playoff time. It'll be the final time the teams play this season, and the Pens will finish with no worse than a series split after beating Nashville 2-1 in October. 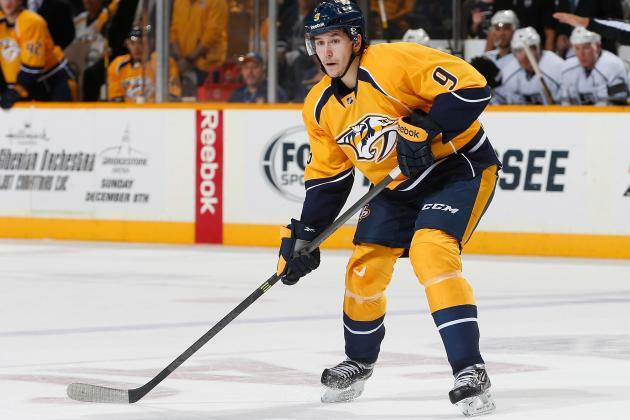 The Nashville offense is led by Filip Forsberg, who leads the team with 31 goals and 58 points on the season in his second year in the league, a year after scoring 26 goals with 37 assists for the Predators as a rookie. Though he was snubbed by not being named a Calder Trophy finalist last year, Forsberg has provided much needed offense ever since stealing him away from the Capitals for Martin Erat and Michael Latta at the 2013 trade deadline. The Predators have managed to do well the past few seasons reinforcing their top six via trade. James Neal is right behind Forsberg with 30 goals on the season and is third on the team with 52 points. Although he's seen a drop off away from Evgeni Malkin, he's adapting to playing in Nashiville, which means not having the same shooter role on the team's power play. He's actually scored a career high 23 5-on-5 goals this season, and he's been on fire recently, scoring 17 goals in 38 games since pairing up with Ryan Johansen. Johansen's shooting percentage this season (7.4%) is way down from what he managed to two previous years (13.4%), but despite that he's still managed 53 points on the season and gives Nashville another potential goal scoring threat if and when his shooting percentage recovers. But what really allowed the Predators to trade away Seth Jones for Johansen was the strength of their defense. Nashville has four defensemen with over 30 points this season, and Ryan Ellis' 31 points leaves him one point shy of placing four Predators Dmen in the top 40 among scoring from the blueline. They're led by Roman Josi, who is 4th in the league among defensemen, and second overall on Nashville, with 57 points. Not far behind is his defensive partner Shea Weber with 48 points, and with 18 goals Weber ranks 4th himself in goal scoring from the blueline. With Mattias Ekholm (33 points) and Ellis rounding out the top 4, it's easy to see why the Predators would feel comfortable trading a young player as talented as Jones. While the offense has started to click for Nashville, they've been uncharacteristically bad on the back end as Pekka Rinne continues to struggle. Stellar play from 2010-12 (0.926 SV%, 2.26 GAA) had helped Rinne enter the conversation of elite netminders in the league as he earned nominations for the Vezina Trophy in both 2010-11 and 2011-12, but he struggled during the lockout year, and he missed all but 24 games the next season with a hip injury, though he was awful in the time he did play with a 0.902 SV% and 2.77 GAA. He rebounded nicely from the injury last year and earned the 3rd Vezina nomination of his career, but with a 0.909 SV% and 2.44 GAA this year it's fair to wonder if the 33-year-old goalie's best years are well behind him. Luckily for Nashville they've managed to minimize the negative impact of their goaltending by being one of the best possession teams with a 53.1 SACF% on the season, but shaky goaltending entering the playoffs could spell trouble for the Predators. - Oskar Sundqvist is certainly familiar with the drive between Pittsburgh and Wilkes-Barre at this point of the season, and the team recalled him from the Baby Penguins yesterday for the 3rd time in the past two weeks. - Pittsburgh is on the verge of clinching a playoff spot as their magic number is four heading into tonight's game. If they win tonight, and the Red Wings lose in regulation tomorrow, Pittsburgh will be going to the playoffs for a 10th straight season, which will become the longest active streak in the league if Detroit finds itself outside looking in on the postseason this year.